This photo is from a visit FM & I made 12 years ago to a friend’s home in Hawaii. 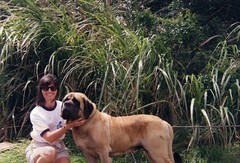 I’m with Thurston which is one of two English Mastiffs my friend owned and, although I hadn’t met the dogs before, we became fast friends. Claudia was the older of the two dogs and she would lay at the front door. When we got to the house, I leaned over her and rang the door bell. My friend called for us to come in so I stepped over Claudia and walked in. As I got to the kitchen, I realized FM wasn’t behind me. I went back out and he was still in the same spot. FM said: “She won’t let me in” Sure enough, every time FM tried to step over her, she growled. Don’t know if you’ve ever heard a mastiff growl ~ it’s low and deep and there’s no doubt, if you made her get up, there would be no bark, just bite. It’s the only time I’ve seen hesitation on FM’s part. There are big dog people, small dog people and ‘no dog’ people. I definitely fall into the the big dog catagory. I’ve always loved the personality of those gentle giants. My dream is, if we ever find a place to settle down, to have an English Mastiff AND an Irish Wolfhound. Imagine the dog food bill for those two. 😉 FM prefers a black lab ~ it’s his favorite dog of all. Guess we better plan on a place with lots of yard space. Beth: that would explain a lot about several people I know who got one, and sometimes two small dogs within weeks of when their youngest child moved out ~ empty nest had set in. I read once that people who like small dogs are looking for a baby substitute and people who like big dogs are looking for a friend. Not sure if there’s any truth to that, but I thought it was interesting. I would also say that those Sarah McLaughlin (sp?) commercials get me teary eyed every time.